Learn over 120 effects on this 4 DVD set! Jump-start your magical journey into the world of card magic. On this complete course you get everything from beginner to expert level card magic. You will also learn the great sleights controls and flourishes of a proficient card technician. 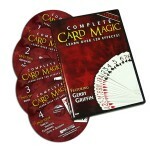 Highly respected magic instructor Gerry Griffin will take you step-by-step through your entire journey into card magic. Jump-start your magical journey into Complete Card Magic with these fourteen introductory mysteries. Volume One offers a strong foundation for building your own card magic routines. Card expert Gerry Griffin takes you step-by-step through some amazing mysteries. The Betting Game – This fun effect fools them every time. A Simple Card Revelation – Here’s a little mystery with a big finish. Eyes Are The Window to the Soul – Look into their eyes and find their card. Pulse – Find a card while feeling their heartbeat. 21 Card Trick – A contemporary classic using three rows of seven. CRUNCH!! – Find a chosen card using your sense of bite. Up to Her Old Tricks – The gypsy queen helps you find the selected card. I’m Having a Spell – Spell out a random card to find a spectator’s card. Lie Detector – If they lie about their card truth is you’ll find it. What is He Talking About? – Name the wrong card but show you were right. Cowboys and Indians – This story will become one of your favorites. Into the Future – You predict the cards that they randomly deal. Sisters – Two queens mysteriously find their sisters. Do as I Do – Two decks are exchanged until you both select the same card. Continue your magical journey into Complete Card Magic with these fourteen intermediate mysteries. Double your card magic repertoire with these little miracles on Volume Two. Card expert Gerry Griffin takes you step-by-step through the next level of mystery. 21 Card Trick Outdone – A new spin on a contemporary classic. The What? – A card instantly changes in a spectator’s hand. Further Than That – A multi-level mystery that is sure to impress. Lie Detector II – A great follow-up to the original mystery. Use Your Powers For Good – A mystery that tests a spectator’s psychic powers. Color Changing Deck – Find a blue card in a red deck or is it a blue deck? Time Travel – Go back in time and find cards where they started. Invisible Cards – Name their card using an invisible deck. Incredible! One the Easy Way One the Hard Way – Two techniques for finding two selected cards. Amazing Aces – The aces appear on the tops of four random piles. X Marks the Spot – A lost card reappears on an imaginary “X”. Card Thru Hand – Riffle a card through your hand and into their hand. Quicker than the Eye – Cards quickly switch places right in their hands! Two Card Challenge – Two cards selected two cards found but you’ll still fool them. Your magical journey into Complete Card Magic gets advanced with fourteen all new mysteries. Volume Three contains effects that are better than some full routines but it doesn’t end here. The Ace Challenge – Four cuts all produce the ace of spaces or do they? Twisting the Aces – The aces appear even the stubborn ace of spades. Marked Deck – Your home-made deck looks normal or does it? Amazing Ace Thru Four – Turn these cards over then change their color. Back to Basics Poker – Five cards with no faces become a Royal Flush. Magnetic Finger – Find cards thru a hanky with your magnetic finger. Stabbed Coincidence – They stab their card right between matching cards. Riffle Stop Poker – Riffle flip and twist the cards into a Royal Flush. Acrobatic Aces – Aces jump piles until one gets stuck in the middle. Card Warp – Two cards folded together go thru a time warp. Coney Island Caper – Hungry enough to eat a playing card hot dog? Homing Card – Find their card in your pocket not once but twice. Rub-away Cards – Rub cards into your pocket right thru the fabric. Triumph – Will you lose their card in the deck or will you Triumph? Your magical journey into Complete Card Magic gets really exciting with TEN new mysteries. Volume Four goes above and beyond average card magic routines. These effects are sure to impress. A Very Good Hand – Turn a hand of five blank aces into a Royal Flush! Oil and Water – Jacks and aces magically separate like oil and water. Chicago Opener – Their card turns blue in your red deck. Amazing! Jacks or Better – Their chosen card jumps right between the Jacks. The Sound of your Cards – Listen. Your cards tell you where their card is. Simple Arithmetic – Two wrong cards can make the right one. Awesome! The Ambitious Ace Thru Five – Five cards rise to the top with a powerful finish. One Last Card – Their card is always in the last place you look. You Ain’t Going to Believe This – You lose their card but it finds its way back. Fancy Ace Cutting – Four crafty ways of finding your friends the aces. Complete Card Magic Volume Five is Extreme! You will see and learn the best of the best in card mysteries. This DVD includes TEN expert effects that will become your favorite showstoppers. The Collector – Four Aces capture three selected cards in the deck. The Man from New York – When you cut to the Aces you unshuffle the deck. Gambler’s Thumbs – Catch a card cheater by watching their thumbs. Chameleon Card – A card changes color in their hand and in mid-air. The Most Ambitious Card Mystery – Many ways to make their signed card rise to the top. Gerry’s Jumping Coin Trick – Add some flare with magical jumping coins. Optical Illusion – Change Aces into Kings and back again. Incredible! Computer Deck – Turn your deck into a hi-tech cardboard computer. Real Magic – The amazing Aces outsmart the rest of the deck. Volume 6: Forces! Shuffles! Flourishes! Your magical journey of Complete Card Magic would not be complete without card handling techniques. In Volume Six you learn important moves to manipulate cards and add flare to your routine. Learn step-by-step through 27 different effects. Forces – Do you want to know their card before they select it? You will learn FOURTEEN ways to FORCE a card! Shuffles – When you mix the cards you may also control them! Here are SEVEN essential methods of SHUFFLING! Flourishes – Enhance your card magic by adding some eye candy. Add these SIX card FLOURISHES to your routine! Volume 7: Cuts and Sleights! Complete Card Magic includes over 100 cutting edge card mysteries and techniques from beginner to expert extreme! Now in Volume Seven you are ready for the best in card cuts and sleights. Learn step-by-step through 31 expert card techniques. Cuts – Cutting the cards is more than dividing the deck. Add flare and control with TEN famous CUTS! Sleights – Sleight of Hand is the key to card magic success. Master these 21 SLEIGHTS and amaze everyone! The Double Lift Braue Reverse Table Palm.